Palmako Veronica 7 9.2m²: The Palmako Veronica 7 Summer House is a perfect octagonal summer house, featuring 7 x double windows and 1 x double door there simply could not be a more brightly lit or appealing summer house. 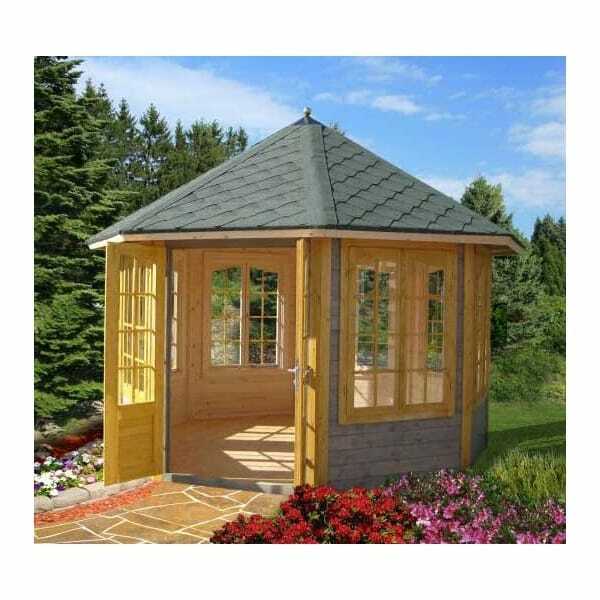 Simply ideal as a beautiful feature in the garden as well as offering many practical uses, the Palmako Veronica Log Cabin Summer House is a superb value accessory to any garden. Just imagine having guests, the Palmako Veronica 7 with a Chandelier in the evening, maybe have the garden furniture in there to extend the summer evenings and the bbq season into autumn!